How are you! May I ask why you do not have LCD 1602 Keypad Shield, I think this will be a bit better! But I do not know how wiring, some guidance about it? Copied the Panelolu2 schematic/pinout and got Marlin/Sanguino/MCP23017 running smoothly today - display wise. SD and Encoder not yet but have not really dug into it. Used Think3dPrint3's pinouts so was expecting the #define PANELOLU2 to do its thing without having to tweak pinouts in code again. > SD-Card now running with Repetier ? That one would use too many pins. Looking forward to your Gen7 test. I really would like to be able to print with no computer hooked up. Been trying to figure out how to do it. I would like to try the Touch TFT that is on Thingiverse. Anyone has the final schematic for a LCD 20x4 and SD + Encoder? Anyway to make an SPI 4x40 display work in marlin I know I can make an sd card adapter work if I keep the cables short (have a micro sd one from reprapdiscount I could utilize. But I would need an lcd to make it work. Because I would like to make it work with marlin anyone know if that is feasible the lcd shield you folks discussed in this thread? 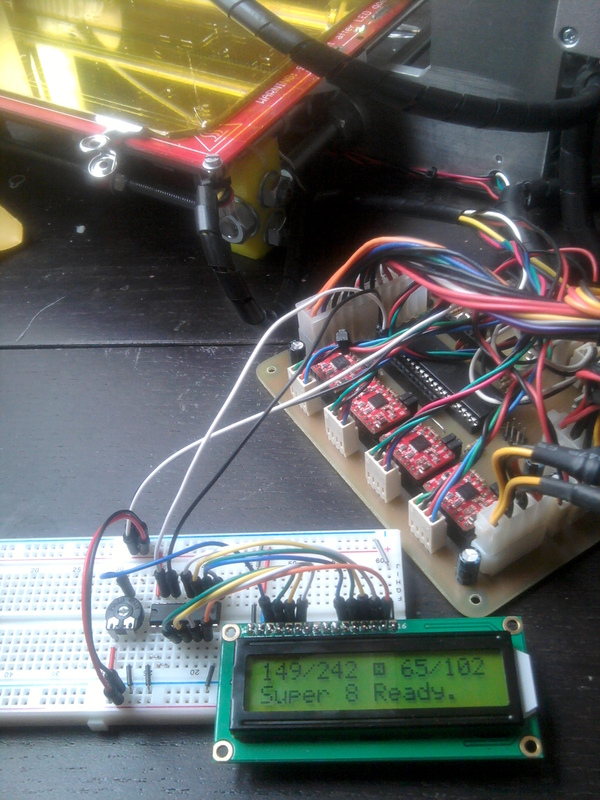 I'm currently trying to keep PCF8574 and using LCD_I2C_TYPE_PCF8575 in Marlin. 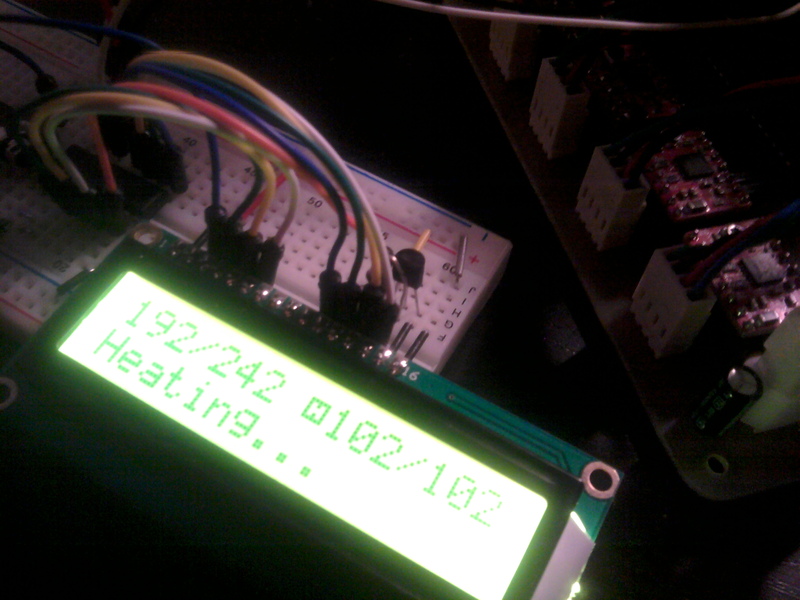 By now, only LCD is tested  (still waiting for a rotary encoder and a SD socket). I add some #defines into Configuration.h and pins.h  and wire the LCD and de IC using the default pin mapping from `ultralcd_implementation_hitachi_HD44780.h` , and switching the backlight with a BC557 as in DigisparkLCD schematics . * If I send M81 and turn the PSU off, I can't turn it on again by sending M80. It only happends when LCD is powered by +5V; if it's powered by 5VSB and it's not turned off when M81, I can use M80 to turn PSU on again. Seems to be som related to backlight or whatever... or capacitors... Do I need some capacitors in the LCD circuit? It seems you have this working with marlin. Have you had any success getting it to work with repetier. I have been searching and it seems there are issues with 1284 based boards and I2C in repetier. I built Nightfly's version and everything works with Repetier except the SD card. Never have figured that out yet.